This post is all about how I made my bunting quilt with the Accuquilt GO! Cutter and the Triangles in Square die. Geez, that is a lot of links. I was only using the triangle (A) part of the die, not the half triangles (B). The area of fabric needed to cut the triangle part is 4x6". So for the white fabric, I used three strips 4 inches across the width of the fabric. This seemed like the way to waste the least amount of fabric, as opposed to cutting lengthwise strips as Accuquilt advises. A few of the white triangles did seem a little stretched out compared to the other triangles but it didn't seem to affect my final results. I layered my die, fabric and cutting mat. It makes me a little crazy to send the die through the cutter without using half of the die, since those blades are cutting into the mat anyway and deteriorating it over time. But I didn't really want any half triangles hanging around so I just cut the whole triangles and sent the die through without any fabric over the half triangles. There was not much fabric wastage as I cut the white triangles, because the trailing edge of the first cut could be lined up with the leading edge of the next. The only significant waste was at the beginning and end of the strip. Three strips gave me about 54 white triangles. Of note, my sister called me as I was about to cut the white triangles and I was able to cut all of them while talking with her on speaker phone. I don't think I would have tried that if I was cutting these triangles with a rotary cutter! This is all that was left of my strips after cutting my white triangles. Then I picked some fabrics for my flags. I made myself a little template and used it to cut 4x6" rectangles from 25 different fabrics. Then I stacked those up and cut them, four layers at a time, for a total of 8 triangles per pass. Using individual rectangles instead of strips resulted in a little more fabric wastage, but I think you'd have most of that cutting it with a rotary cutter too, simply because the triangle shape leaves odd scraps. This kind of gave me chills. They look so beautiful and perfect! They stack up quick. Piecing triangles does not come intuitively to me. But with these dog eared corners, anyone with a pulse and a sewing machine can get it right. Why not have a margarita? No, wait. Two margaritas. I started by piecing 50 units of one white and one colored triangle each. I think this would make a great "leaders and enders" project. That was my original intent but I ended up grabbing it on my way to a guild sewing night at Modern Domestic and doing it all in one sitting. You do need to make sure you piece the units consistently (white on the left, colored fabric on the right, for instance). After piecing all the two piece units, press seam allowances toward the colored fabric. Then piece the units into four strips of about 12 units each. You may want a little helper to figure out your preferred arrangement. Lengthen or shorten the strips as needed. Use the remaining white triangles to add to the ends that need them. Lay out a single piece of white fabric, about 36"x44". Lay your bunting strips where you want them to go. Then slide your fabric ruler 1/2" underneath the top edge of your first strip, then carefully lift the strip up and mark the cutting line on the fabric (I used a regular pencil). Replace the strip and repeat along the bottom edge, marking a line 1/2" above the bottom of the strip. The fabric between these lines will eventually be discarded. Repeat, marking lines for each strip. Cut and sew these seams one at a time. Do not try to cut them all at once. Even cutting one at a time you will have some crazy bias situation and pins are the answer to that problem. Pin it to death before you even pick it up. This is coming from someone who almost never pins anything, so you know it's serious business. Sew with the pieced strips on top to reduce stretching in the bias edge. Square it up, congratulate yourself heartily, and finish that sucker. Whew! I can honestly say I only did this project because I had the Accuquilt GO! cutter. If I'd had to learn how to cut all those triangles on my own I'd still be in the design stage for sure. The GO! cutter made a somewhat challenging design more doable. I'd say it's a pretty handy tool. A handy expensive tool. If mine disappeared and I had to decide whether to buy a new one, I'm honestly not sure what I would do. I might take the middle road and get the GO! Baby because of the big price break between the two. The GO! cutter does seem like a quick way to get scraps cut into usable consistent sizes and that's how I've been using it lately. I keep some squares I've cut handy so we have something to use when my toddler heads to the sewing machine saying "Mama, sewing?". I really think one of these cutters would be a good thing for a group of quilters to share. Unless you're pumping out a quilt a week, this thing is going to sit in your closet most of the time. I'm hoping to make mine available at guild sewing events, and PMQG members, if you have a project the Accuquilt GO! could help you out with, talk to me about borrowing mine! 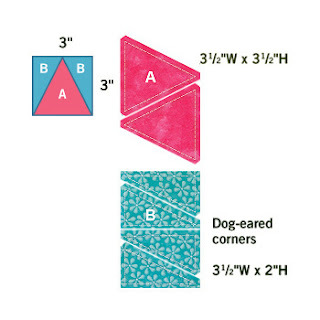 If you make a quilt using these directions, I hope you know I'd be tickled pink to see a picture! Now let's see about getting an Accuquilt GO! into the hands of one of you lovely readers... soon, soon, soon! Wow great quilt! Yes it would be nice to have one, and you have a good idea about a group (or a guild) sharing the expense. Thanks for sharing how you did the bunting quilt. What fun. Great idea. I have these dies and can't wait to try this. Thanks for sharing! love the bunting, looks great on the quilt. I've been wanting to try one for a long time but the price keeps me from it. Very cute! I shared it on the AccuQuilt FB page - hope you don't mind! Well done. That cutter seems to make pretty fast work of it all! Love it! Im having Accuquilt Envy. I would love to buy one, and price is the only thing holding me back. In Australia the cheapest I've found is $455. That's a lot of money to have sitting in the sewing cupboard, when it's not in use. Your creativity is further inspiration, however.....where did I put those supplier details. That's got to be such a great timesaver to own one of those awesome machines. I would love to be able to afford to buy one for myself from all I've seen so far. I love the tutorial on how to make that quilt. I have seen this same quilt before and just love the way it looks. What a fun looking quilt. I love new ways to do things. great job! just got a Go! from Joann's. On sale right now for 199.99. Looking forward to getting started! This is a super cute quilt! Love the wedding quilt too. I have this die but never thought about using it to cut just triangles. I love triangle quilts so I'll put this one on my to do list. Thanks. I would love to pin this on Pinterest under my Tutorials.